The start of a new Grand Prix season is always going to bring with it an air of grandeur, whatever the expectations and at whatever venue it may run at. No matter how much many question the regulations (have they done enough to make the cars follow better? ), the predictability (will Mercedes dominate again? Do I mind if they do or should I enjoy this consummate performance? ), the governance or indeed any other aspect of single-seater racing's flagship series, they will settle down to wherever they can follow the season opener on tenterhooks. That Formula 1 chooses to open with such an illustrious event as the Australian Grand Prix only serves to amplify its cause, as this Antipodean land is steeped in motorsport enthusiasm and history. For many of us, the memories of the Australians bringing down the season in Adelaide stand forth, but from 1996 what has become a new tradition emerged, as Melbourne's blast through Albert Park, with its straight lining the lake and short corners, surrounded by gravel and grass, has become synonymous with Formula 1's first days back at school. In reality, it can be something of a tease, as the uncharacteristic closed-road layout doesn't let the aero features stretch their legs and we can leave the state of Victoria with many doubts about how the season will go or a skewed perception of relative performance. Given the difficulty in overtaking in Albert Park, the goodwill felt towards this venue goes some way to explaining how it has done well to enter people's affections. For a population of now around 25 million, Australia has had a decent return of results on the international stage, most notably with Sir Jack Brabham (a three-time world champion, once most impressively with his own Brabham car) and Alan Jones world champions, and more recently Mark Webber and now Daniel Ricciardo serial winners. Holding world championship status for 35 years, the Grand Prix has a much more extensive history. The first one is believed to have been held in 1927 in Sydney, although information is sparse, while the following year saw the 100 Miles Road Race on Phillip Island, with cars in four classes (up to 750cc, 751-1100cc, 1101-1500cc and 1501cc to 2000cc), won by Arthur Waite in an Austin, an event rechristened the Australian Grand Prix the following year and which was won by Bugattis (mostly Type 37, 37A and 39 and until 1932. From this year, the race was run on a handicap system, with entrants starting at intervals, and held for cars up to 2000cc. The following year, the event was opened up to 2300cc engines and won by Bill Thompson's Riley Brooklands, with Bob Lea-Wright's Singer Nine winning in 1934. 1935 was a return to the 2000cc limit and MGs mostly dominated the finishing list with Les Murphy's MG P Type the victor. The 1936 event (on 26th December) was retrospectively classified as the 1937 Australian Grand Prix, and took place on closed public roads between Port Elliot and Victor Harbor and was for factory-built and catalogued racing cars and sports cars, with no engine capacity limit. Les Murphy's MG P-type won in a little under four hours. Bathurst's Mount Panorama track saw its inaugural event when the Grand Prix meeting arrived in 1938 and was held over 40 laps of the 3.8-mile circuit. In a field of Australians, the event saw two British drivers turn up and one of them, Peter Whitehead took victory, his status as a scratch handicap competitor perhaps assisting him, in an ERA B Type 1.5l. The town of Lobethal organised the 1939 Grand Prix. At 8.6 miles, there were 17 laps, and the MG TA 1.3L of Allan Tomlinson won at an average speed of 84mph. Post-war, the Australian Grand Prix alternated between various states, including races on airfield tracks and street circuits and was run to Formula Libre rules. They included no less than Bathurst, Point Cook, Leyburn, Nuriootpa, Narrogin, South Port, Port Wakefield, Caversham, Longford, Mallala, Warwick Farm, Sandown, Lakeside, Surfers Paradise, Oran Park, Wanneroo, Calder and, Albert Park itself, in 1953 and 1956. Jack Brabham won his first Australian Grand Prix in 1955 in a a Cooper T40 Bristol 2-litre. The old Albert Park circuit, incidentally, was run on a similar layout to today's, but went anticlockwise instead of today's clockwise direction. Lex Davison and Bill Patterson's shared the victory at Caversham in 1957, while future world champion Alan Jones's father Stan won at Longford the next year. In 1964, the rules stated that cars must comply with the Australian National Formula or Australian 1 ½ Litre Formula. In 1968 at Sandown Park, Jim Clark (Lotus 49T) pipped Chris Amon (Ferrari 246T) at the post by 0.1 seconds, but the following year Amon won, leading home Derek Bell for a Scuderia Veloce 1-2 in their Ferraris. The 1970 edition at Warwick Farm was held for Formula 5000, 2.5-litre Australian Formula 1 and Australian Formula 2 machinery and marked the first time since 1956 that the Grand Prix did not form a round of either the Tasman Series or the Australian Drivers' Championship. Frank Matich won and repeated the feat the following year, this time in his own car. The rest of the 1970s featured few Formula 1 drivers, but 1980 at Calder Park saw World Championship Formula 1 cars permitted and home hero and newly-crowned world champion Alan Jones competed in his Williams with his own entry. In the race he tangled with Bruno Giacomelli's Alfa Romeo and the Italian emerged in the lead. Jones got him back though and made himself and Stan the first father-and-son to have won the Australian Grand Prix. Jones remains the last Australian to have won the race. The following year, it was a Brazilian driver and Graham Watson Motor Racing 1-2 with Roberto Moreno leading home Nelson Piquet from Geoff Brabham in his private entry (all in Ralt RT4-Fords, the machinery which was to take victory up to 1984). 1982 saw an Australian fail to be on the podium for the first time since 1968, this time with French drivers taking the top two slots with Alain Prost winning from Jacques Laffite. In 1983, John Smith took the final podium for an Australian until the present day (Mark Webber getting on the podium for his solitary point in the Minardi does not count! ), with 2nd place. Roberto Moreno won both this year and the following one. Australia joined the Formula 1 World Championship in 1985 with the Adelaide street race and the Grand Prix has been on the calendar ever since. In the first race, Niki Lauda led on his own final race until retiring with brake failure, while Keke Rosberg won in his McLaren from the Ligiers of Jacques Laffite and Philippe Streiff, the latter completing the podium despite having just three wheels properly attached to his car, with his front axle damaged after touching his team-mate. 1986 was the scene of Nigel Mansell’s dramatic failure to take his first championship. He headed into the race battling team-mate Nelson Piquet (seven points behind Mansell) and McLaren’s Alain Prost (six behind) for the title, and was set to take it when, while in a comfortable 3rd position on lap 64, his left-rear tyre exploded and Nigel struggled to control it, the blow out ending in a minor touch with the barrier at the end of a straight. Piquet now led, but Williams made a precautionary stop for him and Prost came through for race victory and his first championship win. Alan Jones competed in his and Haas's final race (a new version of the team making a comeback in Australia in 2016). 1987 witnessed a Ferrari 1-2. Gerhard Berger led home Lotus's Ayrton Senna, but the Brazilian was later disqualified for oversized brake ducts. Michele Alboreto took the slot, while Thierry Boutsen completed the retrospective podium for Benetton. Prost beat his new team-mate and new world champion Senna in 1988, while 1989 was a wet one, stopped after 70 laps with 11 scheduled to run. Boutsen won for Williams. Pierluigi Martini, having qualified an excellent 3rd in his Minardi, came home for the final point in 6th. Piquet won in his Benetton from the Ferraris of Nigel Mansell and Alain Prost in 1990, while 1991 saw the shortest ever Grand Prix. Held in atrociously wet conditions, Senna won from Mansell and Berger when the race was called off after a mere 14 laps. Mansell and Berger had both gone out of the race, but the early stoppage rules meant that the results went back one lap, when they had still been running. The following year, Gerhard Berger took the win for McLaren, with the Benettons of Michael Schumacher and Martin Brundle filling the other steps on the podium. World championship-winning Williams saw both their cars go out, Patrese due to an engine failure and Mansell retiring following a botched move from Senna, which also saw the Brazilian have a DNF. 1993 is remembered as Ayrton Senna's final Grand Prix victory. Williams pair Alain Prost and Damon Hill followed him home and Senna and Prost's chumminess on the podium seemed to end their long-standing feud. A year later, the Formula 1 climate had changed. The dramatic denouement of the championship battle saw Schumacher drive into Hill in a desperate last-moment bid to save his season after he had gone off and brushed the wall. Hill, having not seen the incident, did not hang back in his attempts to pass and was soon brought into the pits, handing the German the first of his record-breaking seven titles. Meanwhile, Nigel Mansell, like Senna a year earlier, took his final Grand Prix win. A race of attrition in 1995 featured some unusual key players, with just eight finishers and a dominant Damon Hill sealing the win by 2 laps. Olivier Panis somehow made it home 2nd in his Ligier despite a messy oil leak, while Gianni Morbidelli got Arrows’s penultimate podium and last for a year and a half before Hill took his runner-up slot in Hungary. It was in practice that Mika Hakkinen suffered his big impact with the wall and he was in a bad way. Impressively, he managed to return by the next race the following season, which was also the Australian Grand Prix, with the return of Albert Park. Jacques Villeneuve had something of a sensational debut, with pole position and almost the win, before an oil leak caused by an off-track excursion handed it to that season's eventual world champion Hill. Martin Brundle had a dramatic barrel roll on the opening lap, but made the re-start in the spare car. In 1997, new world champion Hill was out before the start with a jammed throttle in his Arrows. Ferrari's Eddie Irvine eliminated himself, Villeneuve and Johnny Herbert at the first corner. World champion team Williams's new signing Heinz-Harald Frentzen was running well and closing up on leader David Coulthard and Ferrari's Michael Schumacher. Schumacher made an unscheduled stop and Frentzen moved into second, but retired when a brake disc failed, promoting his compatriot back into second, with Coulthard winning for McLaren. In 1998, McLaren dominated the first race of the new regulations with the narrower cars and grooved tyres, although there was controversy when David Coulthard was forced to move over for Mika Hakkinen, following a pre-race agreement about whoever got into the first corner first being given the right to win. That year's eventual world champion had done just that, but received an erroneous call asking him to pit, leaving Coulthard in the lead, which Coulthard conceded. Hakkinen took his second ever and second straight win, while Bridgestone tyres took their first. The next year also wasn't plain sailing for McLaren. Firstly, the Stewarts of Rubens Barrichello and Johnny Herbert had oil leaks on the grid with small fires and the start was aborted. Then on the next start, Hakkinen, on pole, eventually got going just before the final car left the grid and took up his place, but Schumacher stalled behind Hakkinen and had to start from the back. Hakkinen slowed from the lead with throttle problems on Lap 18 and retired shortly after, while second-placed Coulthard had earlier gone out with a transmission failure. Ferrari's Eddie Irvine took his first Grand Prix win, ahead of Jordan's Heinz-Harald Frentzen. With only eight finishers, there were other unusual placings, with the Arrows of Pedro de la Rosa (a point on his debut) and Toranosuke Takagi in sixth and seventh. The 2000 race saw a similar occurrence for McLaren, this time both cars going out with Mercedes engine failures, first second-placed Coulthard, then leader Hakkinen. Michael Schumacher won for the first time, from new team-mate Rubens Barrichello. In 2001, a collision between Villeneuve and Ralf Schumacher in which a wheel from the Canadian's car got through a gap in the fence, caused the death of marshal Graham Beveridge. Schumacher won the race, while debutant Kimi Räikkönen (like De la Rosa) a year previously, took a point on his debut in sixth. In 2002 and for the third year running, there was a points-paying finish for a first-time starter, this time Mark Webber's turn in the Minardi, scoring two points for fifth. He and team boss Paul Stoddart even featured on the podium after the top three had gone. Also, like two years previously, there were just eight finishers, many eliminated in a first-corner collision. Michael Schumacher was a familiar winner, though. In 2003, Schumacher ended his podium-finishing run, which had lasted since Monza 2001, after tangling with Räikkönen. He made it to 4th. It was also the first race in 54 without a Ferrari podium. Juan Pablo Montoya spun at the first corner while leading, handing David Coulthard his final Grand Prix win. Schumacher and Barrichello finished way out front of Fernando Alonso's Renault in 2004, but in 2005, Renault were on form, Giancarlo Fisichella taking the victory and Alonso again finishing 3rd. Jarno Trulli had been running in 2nd in the Toyota, but dropped back with a blistered rear tyre. Michael Schumacher, who had qualified well down the field after being too late to set a time before heavy rain, collided with Nick Heidfeld. Schumacher had another scruffy one in 2006, qualifying just 11th and crashing out. Alonso won from the McLaren of Räikkönen and the Toyota of Trulli. After a year as the third round of the season, Melbourne returned to its curtain-raising role in 2007, with a new feel. With Schumacher gone and in his first retirement, the top three finishers were all new to their teams (the only Formula 1 race this has happened, if you discount the inaugural F1 race at Silverstone in 1950). and in Hamilton's case to Formula 1. Räikkönen won on his Ferrari debut, while McLaren's Fernando Alonso finished ahead of Lewis Hamilton, who was making his first start. Hamilton had made quite an impression, overtaking Alonso on Lap 1. In 2008, Hamilton beat Robert Kubica to pole, but the BMW driver was out after colliding with Kazuki Nakajima. The McLaren man won from Heidfeld and Williams's Nico Rosberg. As with some previous years, there were just eight classified finishers. A year later, the Brawn team, rising from the ashes of the defunct Honda effort, dominated, with Jenson Button coming home to win from Rubens Barrichello. Trulli completed the podium, but was given a time penalty for overtaking Lewis Hamilton under safety car conditions. After some wrangling about the incident, he was later reinstated in the position, while Hamilton was disqualified and McLaren got in trouble for misleading the stewards about whether they had given an instruction to the driver about letting Trulli back past. For the second year in a row, Kubica tangled, this time with Sebastian Vettel. In 2010, Melbourne hosted the second round and Button won in his second race for McLaren, while Kubica got second, after starting back in ninth. The race started damp, but Button timed his stop to slicks perfectly. After Bahrain's cancellation, Melbourne took up its place once again as the season opener in 2011, an honour it has held since, and Sebastian Vettel won from Hamilton and Renault's Vitaly Petrov, with Button beating Hamilton off the line in 2012 to win from Vettel and his team-mate. Lotus's Kimi Räikkönen won in 2013. The 1.6-litre V6 turbo engine made its debut in 2014 and Nico Rosberg, like Alan and Stan Jones, made himself and Keke a father-and-son combination to win the Australian Grand Prix. Kevin Magnussen took 2nd on his Formula 1 debut and fellow McLaren driver took his final podium placing in third, although he didn't stand on it, as home driver Daniel Ricciardo was disqualified from 2nd for breaking fuel flow rules. Mercedes drivers dominated the following year, with Hamilton leading Rosberg home. The German was full of praise for his team-mate, recognising the challenge of beating him. They finished about thirty seconds up the road from Sebastian Vettel's Ferrari. Hamilton slipped down the order at the start the following year, but battled back to 2nd behind Rosberg, while Vettel claimed 3rd. Haas grabbed a point with Romain Grosjean on its debut. In 2017, Sebastian Vettel got Ferrari’s season off on the right footing with victory from eventual world champ Lewis Hamilton. Valtteri Bottas completed the podium for Mercedes. Last year, Hamilton was the filling in a Ferrari sandwich, with Vettel winning. Hamilton had been leading, but Mercedes claimed that a software glitch did not calculate the gap they needed to Vettel to stop him being jumped by the German during a safety car period. 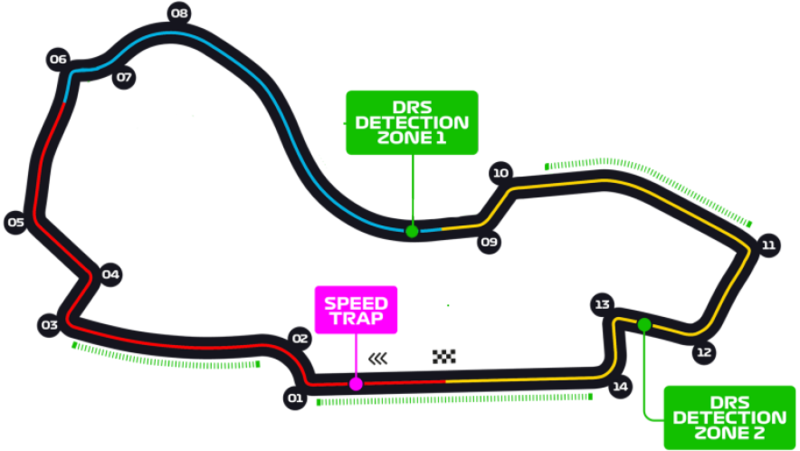 The Albert Park circuit requires a good front end for various parts of the lap and is one of the tracks with a high average speed. Turns 1 (Brabham) and 2 (Jones) form a quick chicane with a long exit. The next straight is never quite straight, making Turn 3 (Whiteford) a slightly tricky 90 right where lock-ups often send drivers off. Turn 4 often requires a lift of the throttle in race trim and Turn 5 is a quick flick right. Turn 6 is a 90 right. 7 and 8 are more part of the next straight. You can carry reasonable speed into 9 (Clark), as the track is fairly open on the exit (10) and leads to a vital straight. 11 and 12 are a short high-speed left and right and again crucial in terms of carrying speed all the way to the next bends, the 90 rights 13 (Ascari) and 14 (Stewart). 15 is a tighter stop, where drivers must soon settle the car on the exit to provide them with their wide exit at the lap-ending Turn 16. Lex Davison and Michael Schumacher are tied on the highest number of Australian Grand Prix wins by driver, with four apiece. Sebastian Vettel will equal them if he takes victory in Melbourne this Sunday. Lewis Hamilton, meanwhile, has just two wins, despite being on pole seven times. The only other current driver to have won here is Räikkönen, also with two successes. The most successful constructors are Ferrari and McLaren tied on 12 wins. Mercedes have a long way to go to catch that with just three. The last Australian driver to win was Alan Jones in 1980 and the most recent to end up on the podium (and not be disqualified, unlike Ricciardo in 2014) was John Smith in 1983. The best finish since then was a 4th for Mark Webber. Only driver has taken his first Formula 1 win here, Eddie Irvine in 1999. If Lewis Hamilton wins the world drivers' championship this year, it will be the first time in history a driver has won six titles with the same engine manufacturer (Mercedes) and the second time a driver has done so with the same constructor (Mercedes), after Michael Schumacher for Ferrari (2000-2004). Last edited by Born Racer; 14 Mar 2019 at 08:56. Please everyone do not jump to the conclusion that this years technical regulation changes are an abject failure after this race, which is often a bit of a procession. Yes, thank you Born Racer for taking the time to write such a comprehensive intro! Despite any misgivings that I may have on the future of F1, I always look forward to the first race of a new season. After this weekend, we’ll see! That Formula 1 chooses to open with such an illustrious event as the Australian Grand Prix only serves to amplify its cause, as this Antipodean land is steeped in motorsport enthusiasm and history. wonderful! you are taking it to new levels BR! after an off season of much complaining by me, i am also looking forward to the race and new season. Where would we be without you BR? Excellent intro as always BR! While I have spent much time over the winter speaking to the problems with F1... I am excited for the first race of 2019! Lots of off track drama and change that is likely to be reflected on track. I am curious to see how it plays out. Wow BR! Thank you for that intro..
And yet another great one, BR. Glad you enjoyed the intro. They take time, but they're worth writing. I think Kimi knows his reputation for making memorable comments and likes a good wind-up these days. I'm not getting too excited about it as I refuse to subscribe to Sky - partly because I have objections to their business model and ethics, and partly because it would be the only thing I watched on it, so not worth the cost. Just taken the time to fully read the intro above, incredible amount of work compiling that information, well done BR. Highlights are fine by me as I'm usually out and about somewhere spectating at a live motor racing event somewhere on a Sunday and aside from the fact that I don't subscribe to skytv, I think that the C4 crew do a pretty good job with their coverage. Just keeping my fingers crossed that team Willy can surprise everyone with a decent result after all the shenanigans. Just have to observe a news blackout Saturday and Sunday mornings. good tip... must also remember to double check my news and sports feed notifications on my phone! So, what are everyone's Australian Grand Prix memories?